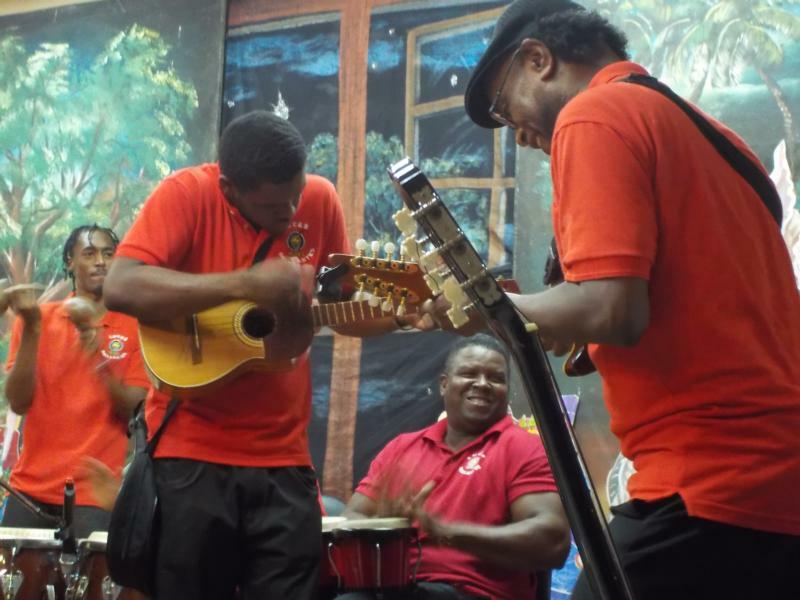 BARATARIA, Trinidad (CNS) — A hush descended on the room as the band — a rambling collection of men and women of ages and ethnicities as blended as the instruments they fingered — settled into their positions. The instruments ranged from Latin scratchers and mandolins, to African-inspired skin drums and a rustic-looking box-bass — literally, a large wooden box just shy of two feet, with a stout, cylindrical mast protruding from one corner normally to the bassist’s breast. A lone, thick string connected the box’s center and mast-top; when plucked, it sounded like a cannon with a cold. Silence, until, at some hidden cue, the first note thundered collectively, truncated almost as soon as it began. Pause. Another note; brief, silenced, the box-bass’ belch like the early roar of war. Then, the Latin-inspired melody released, surging like a battalion charging hot through a breach, like the one made by the Redeemer of whom they sang, who breached the walls of sin and death with a lowly birth. Over the centuries, there was much informal bartering between Trinidad and Venezuela, but the cultural exchange was most noticeable during the late 19th century, when Venezuelan laborers came to work on Trinidad’s flourishing cocoa and coffee estates. The content and sequence of their repertoire would be taken almost entirely from the Gospel of Luke’s infancy narratives of Jesus and were done in Spanish and song. The paranderos were expected to arrive unexpectedly, then began with an introductory piece, called the seranal, in which the band identified itself and asked to be let in. Both Jaggasar and Torres stressed the importance of it. Once let inside, the group would thank their hosts for welcoming them, compliment hosts and home, then proceed to sing of the annunciation and birth of Jesus. Some compositions also included Mary’s visit to Elizabeth and John the Baptist’s birth. Songs of farewell followed, for visits normally lasted 15-20 minutes. Sometimes the visit lasted longer, if the host invited the group to stay, in which case waltzes, bachatas, salsa or other instrumentals were played to encourage people to dance. But that’s now uncommon, said Torres, except in some neighborhoods in which people know each other well. Trinidad’s high crime rates and permissive attitude to drunk driving, said Jaggasar, severely sabotaged the visitation tradition. The earthy throb of parang made it a prime project for local rhythm-gurus. It was blended with soca, an offshoot of calypso. The heady hybrid is called soca-parang and, today, it is standard fete fare even outside of Christmas. Some soca-parang pieces are innocuous enough, but, there are concerns that others are directly at odds with parang’s intrinsic identity. The theme of this year’s local parang festival is “From Nazareth to Bethlehem.” It is intended to be a reflection on Mary and Joseph’s journey to Bethlehem, tracing all the villages they would have passed on the way. Each Trinidad location that hosted a festival event was assigned the name of a biblical village from along the Nazareth-Bethlehem route, and their decorations were expected to reflect some aspect of it.